English actor, whose original name was John Brodribb, was born at Keinton-Mandeville, Somerset, on the 6th of February 1838. After a few years' schooling he became a clerk to a firm of East India merchants in London, but he soon gave up a commercial career and started as an actor. On the 29th of September 1856 he made his first appearance at Sunderland as Gaston, duke of Orleans, in Bulwer Lytton's Richelieu, billed as Henry Irving. This name he eventually assumed by royal license. For ten years he went through an arduous training in various provincial stock companies, acting in more than five hundred parts. By degrees his ability gained recognition, and in 1866 he obtained an engagement at the St. James's Theatre, London, to play Doricourt in The Belle's Stratagem. A year later he joined the company of the newly-opened Queen's Theatre, where he acted with Charles Wyndham, J. L. Toole, Lionel Brough, John Clayton, Mr. and Mrs. Alfred Wigan, Ellen Terry and Nelly Farren. This was followed by short engagements at the Haymarket, Drury Lane and Gaiety. At last he made his first conspicuous success as Digby Grant in James Albery's The Two Roses, which was produced at the Vaudeville on the 4th of June 1870 and ran for 300 nights. In 1871 he began his association with the Lyceum Theatre by an engagement under Bateman's management. The fortunes of the house were at a low ebb when the tide was turned by Irving's immediate success as Mathias in The Bells, a version of Erckmann-Chatrian's Le Juif Polonais by Leopold Lewis. The play ran for 150 nights. With Miss Bateman, Irving was seen in W. G. Wills's Charles I and Eugene Aram, in Richelieu, and in 1874 in Hamlet. The unconventionality of this last performance, during a run of 200 nights, aroused keen discussion, and singled him out as the most interesting English actor of his day. In 1875, still with Miss Bateman, he was seen as Macbeth; in 1876 as Othello, and as Philip in Tennyson's Queen Mary; in 1877 in Richard III and The Lyons Mail. In 1878 Irving opened the Lyceum under his own management. With Ellen Terry as Ophelia and Portia, he revived Hamlet and produced The Merchant of Venice (1879). Hig Shylock was as much discussed as his Hamlet had been, the dignity with which he invested the Jew marking a departure from the traditional interpretation of the role, and pleasing some as much as it offended others. After the production of Tennyson's The Cup, a revival of Othello (in which Irving played Iago to the Othello of Edwin Booth) and of Romeo and Juliet, there began a period at the Lyceum which had a potent effect on the English stage. The Lyceum stage management, and the brilliancy of its productions in scenery, dressing and accessories, were revelations in the art of mise-en-scène. Much Ado about Nothing (1882) was followed by Twelfth Night (1884), Olivia -- an adaptation of Oliver Goldsmith's Vicar of Wakefield by W. G. Wills (1885); Faust (1886); Macbeth (1888); The Dead Heart, by Watts Phillips (1889); and Ravenswood -- Herman Merivale's dramatic version of Sir Walter Scott's Bride of Lammermoor (1890). Fine assumptions in 1892 of the characters of Wolsey in Henry VIII and of King Lear were followed in 1893 by a striking and dignified performance of Becket in Tennyson's play of that name. During these years too, Irving, with the whole Lyceum company, paid several visits to America, which met with conspicuous success, and were repeated in succeeding years. The chief remaining novelties at the Lyceum during Irving's sole managership (the theater passed, at the beginning of 1899, into the hands of a limited liability company) were Comyns Carr's King Arthur in 1895; Cymbeline, in which Irving played Iachimo, in 1896; Sardou's Madame Sans-Gêne in 1897; Peter the Great, a play by Laurence Irving, the actor's second son, in 1898; and Arthur Conan Doyle's Waterloo (1894). The new regime at the Lyceum was signalized by the production of Sardou's Robespierre in 1899, in which Irving reappeared after a serious illness, and in 1901 by an elaborate revival of Coriolanus. Irving's only subsequent production in London was Sardou's Dante (1903), a vast spectacular drama, staged at Drury Lane. He died on tour at Bradford on the 13th of October 1905, and was buried in Westminster Abbey. Both on and off the stage Irving always maintained a high ideal of his profession, and in 1895 he received the honor of knighthood, the first ever accorded an actor. He was also the recipient of honorary degrees from the universities of Dublin, Cambridge and Glasgow. His acting, apart from his genius as a presenter of plays, divided criticism, opinions differing as to the extent to which his mannerisms of voice and deportment interfered with or assisted the expression of his ideas. So strongly marked a personality as his could not help giving its own coloring to whatever part he might assume, but the richness and originality of this coloring at its best cannot be denied, any more than the spirit and intellect which characterized his renderings. At the least, extraordinary versatility must be conceded to an actor who could satisfy exacting audiences in roles so widely different as Digby Grant and Louis XI, Richard III and Becket, Benedick and Shylock, Mathias and Dr. Primrose. 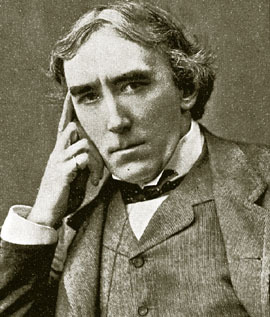 Sir Henry Irving had two sons, Harry Brodribb and Laurence. They were educated for other walks of life, the former for the bar, and the latter for the diplomatic service; but both turned to the stage, and the elder, who had already established himself as the most prominent of the younger English actors at the time of his fathers death, went into management on his own account.